SkyCiv provides a number of advanced operations to speed up your modelling workflow. 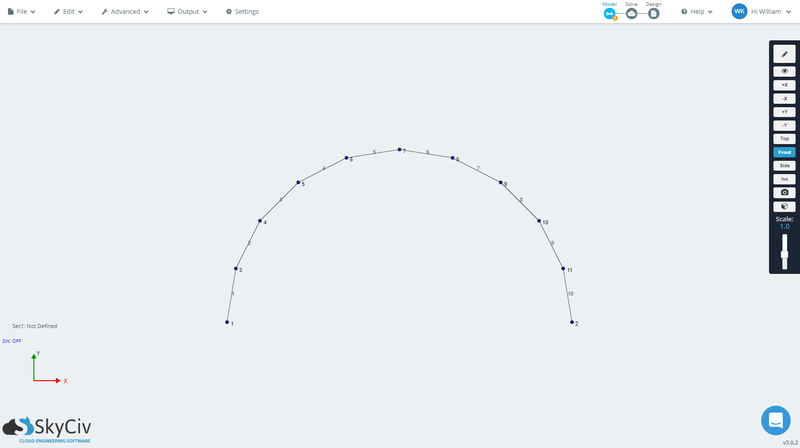 'Curved member' is one such operation which allows you to select 2 nodes and generate an arc (made up of members) between them. This feature is useful when modelling curved structures like curved beams or arches. In this example we will model a curved beam. The first step is to create two nodes. Use coodinates (0,0,0) and (10,0,0) meaning that our two nodes are separated by 10 ft in the X direction. 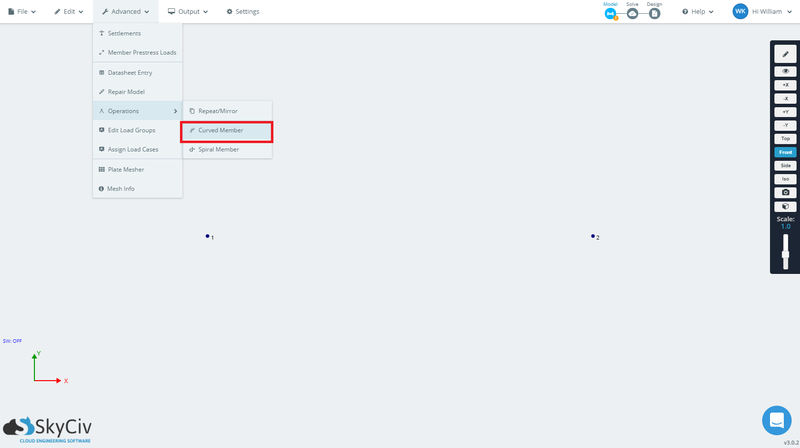 select the two nodes by holding Ctrl and clicking the two nodes. Alternatively you can select them by holding Ctrl and pressing 'a' to select all. When selected, the two nodes will turn blue. 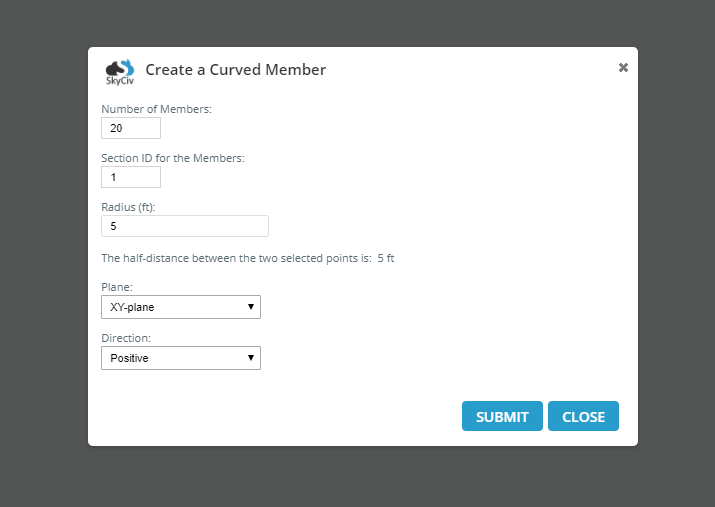 Hover over the 'Advanced' top menu, then hover over 'Operations' to then select the 'Curved Member' option. A popup will appear to give you some options. In this example, we will use 20 members to make up our curve (the more members, the more accurately the curve is represented and vice versa). For the radius, the minimum value is the half distance between the two nodes. Since the two nodes in this example are separated by 10 ft, the minimum half distance is 5 ft. A value higher than the minimum for the radius will result in a 'flatter' curve. You can also specify section ID for the members of the curve to assign them a particular cross section. Plane options (XY-plane, XZ-plane) and direction (positive, negative) can also be specified. The example below is used the settings as above (20 members, with radius of 5 ft). You can undo the curve after you've generated it by holding Ctrl and pressing 'z'. The below is an image of the above undone, and then recreated with 10 members with radius of 5 ft. The image below is of a curve with 20 members, with a radius of 8 ft.